Dale Sailing offers two choices of secure craft storage at our site in Neyland – in Dry Stack or Ashore. 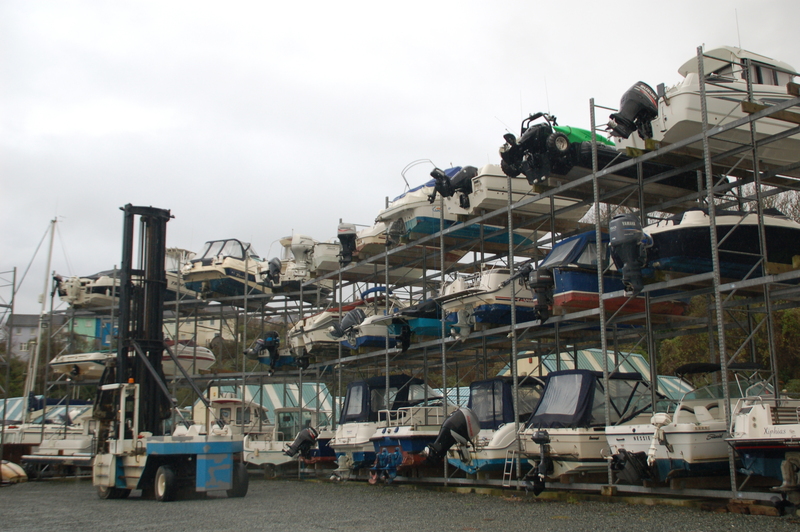 Our secure Dry Stack facility here at Dale Sailing, situated right next to Neyland Marina, means you get all the convenience of a wet berth, however your boat is simply kept in the dry stack and launched and recovered by fork-lift every time you want to use it. With 24hr recording CCTV and Intruder Flood Lighting protecting our main access gate, you can relax in the knowledge that your boat is being kept safe and looked after at all times. Quick Access – Storing your boat in a Dry Stack is better than traditional wet or ground storage because it offers quick, convenient access to the water. Just give us a ring and we can have your boat on the water within an hour! Better for Your Boat – If you store your boat at our Dry Stack, it will perform better on the water. Your boat will be free of barnacles, weeds and anti-foul paint, which means not only a smoother ride for you, but gives you the added benefit of improved fuel economy. 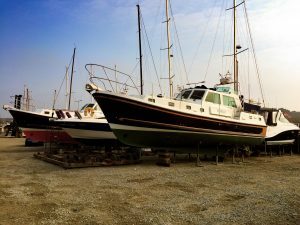 Better for your Pocket – The costs of maintaining your boat will be a fraction of those you would pay if you keep your craft in the water, on a hard standing or on a driveway. You will be amazed at the huge reduction in antifouling, lifting, cleaning and anode expenses. Better for the Environment – Boats stored in a Dry Stack accumulate less oily water in their bilges and do not require toxic anti-foul paint; thus helping to protect the local marine environment. Better for the Future – As your boat is stored out of the water, your drives and outboard engines are less exposed to salt-water damage, so not only will you have less maintenance to do, but your boat will hold its value for longer. Better for You – Launching at 1 hour’s notice – take the stress out of your week-end break: by the time you get to the pontoon, your boat will be ready and waiting to go; it’s as easy as that! Click on the buttons below to check out our Dry Stack Storage and Engine Flushing Prices. We also offer ashore storage with the capacity for up to 250 vessels on hard standing at our site in Neyland. We can accommodate boats in cradles, chocked up on legs or on trailers in secure compounds to help ensure the safe-keeping of all craft in our care. The number of boats that our yard team lay their hands on each year is immense, and through personal communication with the owner, our dedicated boat handlers know exactly how, when and where each vessel needs to be placed. We will work with you to arrange the best time to lift your boat and will follow your instructions once you have decided which method of storage will be best for you. So just get in touch with Christine to arrange your boat lift or ashore storage and she will be happy to advise you on the best options for your craft. As with the Dry Stack facility, our team will work with you and will take time to discuss the best laying up solutions for you and your boat. Whether you require a haul out for winter, a launch in the spring or lifting to and from road transport, our team will handle your boat with the utmost respect and care. They will back this up with impartial, professional advice on how best to maintain your craft in its downtime. Speak to Christine for expert advice on the best options to suit your needs. Click on the button below to check out our Lifting and Ashore Storage prices.